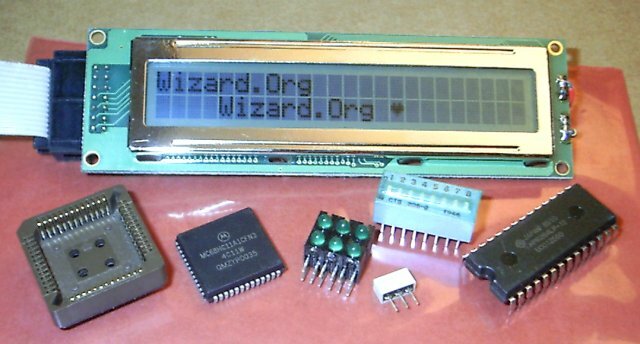 The Motorola 68HC11 is the most highly sought-out processor for experimenters Hobbyists love it for Robotics, Amateur Radio, Home-Automation, Process Control, Animatronics, R/C Servo Control, Model Railroading, and many other sorts of "Home-Brew" gadgets. The 68HC11 has loads of useful features which will make it a winner for your project! 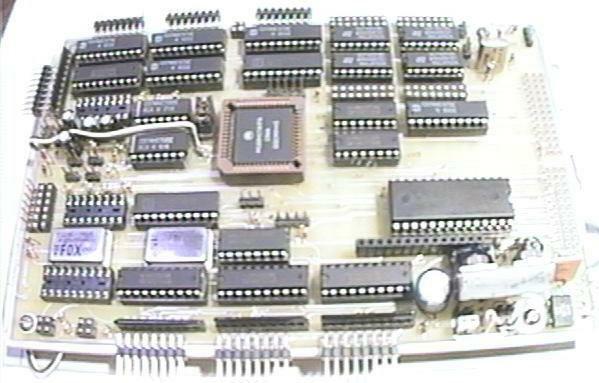 You get all the hard-to-find parts to build your very own 68HC11-based project! The 68HC11 is very popular and extremely easy to use... Don't take my word for it, crank up your favorite search engine, type in "68HC11" and see for yourself how many sites are available to help you use this cool CPU... in fact I'll make it easy for you-- here's a Google search to get you started. Incredibly Easy to Use - The 68HC11 has an Advanced Instruction Set which makes programming really easy. It can operate at a variety of clock speeds from 8MHz all the way down to DC (stopped) for ultra-low power consumption. All of the major peripheral functions are contained on the CPU chip itself requiring only a minimal number of external components to put together a complete working system. The 68HC11 is chock-full of useful tricks! EIGHT Analog Input Channels for measuring voltages (handy in "Real-World" control applications such as Robotics or Home Control. Onboard RS-232 Serial Port and SPI (Synchronous Serial) ports for communication with external devices and downloading user programs. THREE Input-Capture Pins for generating interrupts from external triggers. Real-Time Interrupt function for exceptional timing and control applications. Pulse-Accumulator useful for counting things or events, or it can be used in a Time-Keeper mode for precision timing. Pulse-Width Modulation (PWM) Timing Generator for motor control, power supplies, or other precision control applications. This processor is simply too loaded with features to list them all! Of course, if all this isn't enough for you, you're welcome to add additional components to expand your project to your heart's content! Here's an example showing a board that I designed and built using a 68HC11 that illustrates this CPU's ability. You can build some very clever gadgets with this nifty, clever chip. Obviously, to build this board would require more components than are included in this basic kit (and just to be clear, this board is not included in the lot- it is for illustrative purposes only). So, here's what you get... You will receive a brand-new 68HC11A1 Processor chip, a 52-pin PLCC socket (for the CPU), an 8MHz ceramic resonator to generate the CPU clock signal, a 32K Static RAM memory chip ("skinny" dip package), an 8-position DIP Switch, and a 6-Gang block of LED's (they are discrete within the block) for making indicators. BUT... just to make this deal totally unbeatable, I am also including a 24 Character by 2 Line LCD Display module complete with an attractive silver bezel for great-looking projects. This module uses the standard 14-pin OPTREX-style interface based on the Hitachi HD44780 chipset and includes its own built-in Electro-Luminescent Backlight. The display has been used but is in fine shape. 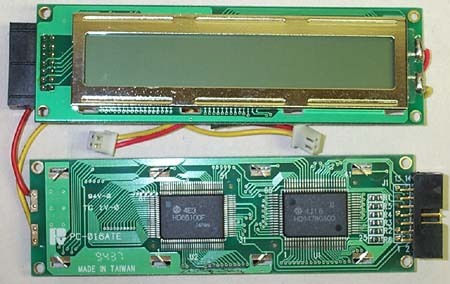 #1 The Static RAM is a 32K Static RAM chip ("skinny" DIP package). 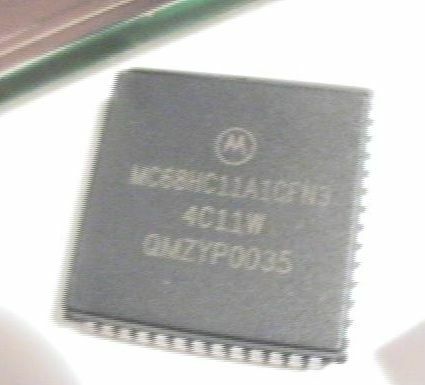 #2 FYI, the CPU variant I'm selling, the MC68HC11A1CFN3 is actually a faster version of the 'A1 chip than most places have for sale. While it works just fine at 8MHz, which is how I personally tend to use them-- it is rated from the factory at up to 12MHz. So technically you're getting a better chip than you thought you were.